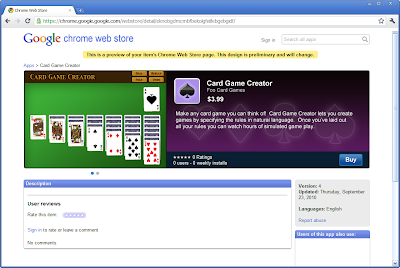 The much anticipated Chrome Web Store will have its debut by the end of this year itself, according to Google. And Chrome Web Store's latest feature addition include integrated Google Checkout and a new Apps Preview for developers. All new Google Chrome Service called Chrome Web Store will debut later this year and new features are finding its place in the Web Store at a frantic pace. New additions include a much needed Google Checkout integration and also a App Preview option for developers. You can now sign up for a Google Checkout merchant account via your developer dashboard. If you are planning to use Chrome Web Store Payments to charge for apps, you will need to complete this setup before you can accept payments. If you already have a merchant account with Google Checkout, you will be able to associate it with your items in the store.